It is a branch of Freemasonry designed to supplement and amplify the philosophical teachings of the first three degrees conferred in the Symbolic Lodge. The Scottish Rite allows a Master Mason to journey deeper into the ethical teachings and philosophy of blue lodge Masonry through dramatic presentation. The Scottish Rite is sometimes called the “University of Freemasonry” because it uses extensive allegory and drama in its degrees to explore the philosophy, history, ethics, and fundamental truths that guide Freemasons’ lives. Is 32° Freemasonry Different than the Scottish Rite? No. The Scottish Rite confers degrees from 4°-32°. We are reinvigorating the use of the term 32° Freemasonry to instill pride and a sense of accomplishment in the men who have committed to going deeper into the highest principles, teachings, and ideals of the Masonic craft. Where Does the Scottish Rite Come From? According to Arturo de Hoyos in his book The Scottish Rite Ritual Monitor and Guide, the Scottish Rite came to the United States by way of France. There is evidence of Scotch Masons’ lodges dating back to 1733 in England, and there were also predecessors such as the Adonhiramite Rite (ca. 1781), which included many degrees that ultimately became part of the Scottish Rite. Yet it was not until 1763 and the creation of the Order of the Royal Secret by Stephen Morin of France that the ritual we practice today began to coalesce into a form recognizable to a modern Scottish Rite Mason. “Scottish” is in name only. How Do I Become a 32° Freemason? To become a 32° Freemason, you must first be a Master Mason. To find out more about joining the Brotherhood of Freemasonry, please click here for more information. If you are already a Master Mason and want to proceed to the 32°, you can complete a membership application for the Valley of Chicago and begin your journey towards becoming a 32° Scottish Rite Mason. How Does 32° Freemasonry Expand on the Degrees I Received in My Blue Lodge? It presents in degrees from the fourth to the 32nd an interpretation of the lessons of the first three degrees by the use of drama and lectures appealing to both the ear and eye to explore the great truths that Freemasonry professes. Are 32° Freemasonry Degrees Considered Higher than the 3° of Master Mason? No. There is no Masonic distinction of higher prestige than that of a Master Mason. The noblest and most significant emblem is the apron of the Master Mason. 32° Freemasonry will take you deeper into the study of Masonic values, philosophy, and teachings. What Is Required for Membership in 32° Freemasonry? You must be a member in good standing in a Masonic lodge, and belief in a Supreme Being is essential. The usual Masonic conditions of residence and sponsorship apply. Will I Be Required to Do Any Memorizing? No. To earn the degrees of 32° Freemasonry, you witness the ceremonies and drama and listen to the illustrative lectures. In order for you to more fully understand and appreciate what you have seen and heard, most 32° Masons attend future presentations of the degrees. Are There Any Religious Disqualifications? 32° Freemasonry does not intrude on the religious beliefs of its members, but it does require that all members profess a belief in a Supreme Being. 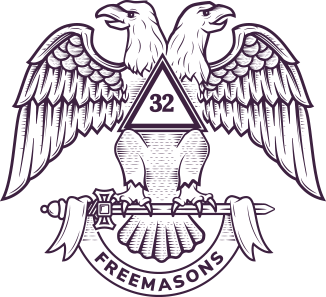 It does not attempt to teach creed of any kind, nor does 32° Freemasonry pretend to be a religion or a substitute for religion. The Scottish Rite practices universality. Minimum initiation fees have been established by the Supreme Council, but each Valley, Council, Chapter, and Consistory fixes its own fees. Each body also requires annual dues as fixed by its bylaws. Some bodies have a provision in their bylaws permitting a member to prepay his dues for the life of his membership in that body. Membership costs will be outlined for you by your local Valley. Will I Be Able to Become Involved in 32° Freemasonry? If you would like to become involved in 32° Freemasonry and make your wishes known, you can expect to be invited to participate. There is a place for you in many of the degree presentations depending on your interests, talents, and experience. For instance, you may serve as a guard or a member of the choir, or be part of the wardrobe committee, the stage crew, or the makeup team. You can be an actor in a minor or major role, as your talents permit. There is also the possibility of being on the reception committee or being an officer of the body. You can contact us for specific inquiries. When Am I Able to Wear the Scottish Rite Ring? After receiving the 14th degree. After Joining 32° Freemasonry, Can I, or Must I, Demit from My Masonic Lodge? No. Termination of membership in a Masonic lodge for any reason automatically terminates your membership in the Scottish Rite. Most Valleys to hold what we call a “Reunion” of the members once or twice a year. At the Reunion, the degrees of the Lodge of Perfection, Princes of Jerusalem, Chapter of Rose Croix, or Consistory are conferred on a class of candidates over a period of a few days. The Reunion also provides the opportunity for social fellowship. This format is also more convenient for members and candidates living some distance from the meeting place. Is It Improper to Ask Another Master Mason to Join 32° Freemasonry? No! Please have no hesitation in inviting a Brother to join. By helping a Brother journey deeper into the teachings of Masonry, you are providing him with the opportunity to not only experience additional fellowship, but to find the true and best version of himself. It ranges from casual to formal depending on the event.